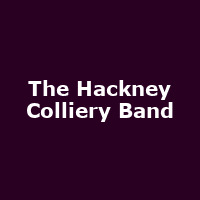 Formed in 2008 out of a desire to play music that appealed to the feet as much as to the ears, the Hackney Colliery Band is east London's unique take on the brass band. Featuring trumpets, trombones, saxes, sousaphone and marching percussion, the band are totally acoustic and yet able to blow the roof off any room. They played the 2012 London Olympics closing ceremony with Madness (playing "It Must Be Love"). Releases include their eponymous debut album and 2013's "Common Decency".